Good for you, diva! You stuck in there through the cashflow projection, business structure, and barriers to entry posts. Now, it is time to dream. Time to dream BIG. Are you in your creative habitat right now? Look around. What surrounds you? Take a look at what motivates and inspires you. Your biggest dreams are hidden just below the surface. Have a notebook, journal, or to-do list hanging around? Dig deeply into the cry of your soul. There is a road map in those daily to-do lists toward your biggest goals. Your Day 9 challenge is to Wake Up and Live Your Dream. Wasn’t this supposed to be about BIG dreams? How much dreaming can you do in ten minutes? As you practice your 10 minute meetings, you’ll find that you are able to access that macro and micro thinking with more facility. Yet, this post is about big dreams. Scary big dreams. It is time to commit to all of those eyelashes, wishbones, dandelions, 11:11s, and birthday candles and every silent wish you have made in your heart along the way. Today is the day for super-sized dreams. Listen very carefully for the cry of your soul. Trust that voice. Let your dreams run wild for a bit and write them all down. If you could change the world or create something that did not exist before, what would you manifest? You are not only a singing robot; so, remember to include all of your big goals professional and personal. Give yourself time to really ponder and wonder on these ten-year goals. After spending time with those ten-year goals, identify the half-way point to those goals. You may want to be recording regularly in five years if it is your goal to win a Grammy in ten years. There are other five-year goals that do not necessarily lead to the ten-year goals. Some singers may want to change location in five years. Your five-year goals may alter your ten-year goals at times. This is starting to become a little more immediate, huh? Think about your stated goals before entering a grad program, for example. Or, the goals that you listed when we started our first go-round of 29 Days to Diva? Time flies as we all know. Now, identify the internal and external factors that will make your five-year and ten-year goals happen. Be very aware of what you can do alone and what you will need from other people. As a singer, you have many gatekeepers before you. You cannot force them to help you achieve your goals, but you can take care of all of the internal requirements for reaching your goals. Now we have reached the point where you can factor in your current circumstances. Start where you are with what you have. You have four quarters this year. What can you do to set yourself up to achieve your two-year goals? Apply the “SMART Method for Goal Setting.” Make your one-year goals: specific, measurable, attainable, relevant, and time-bound. Break down these one-year goals into their most basic steps and plot them on your calendar by quarter. That is what you can put on your to-do list today. Now those ten-minute meetings are looking more and more like the keys to accomplishing ten-year goals. Your dreams depend on what you do everyday. 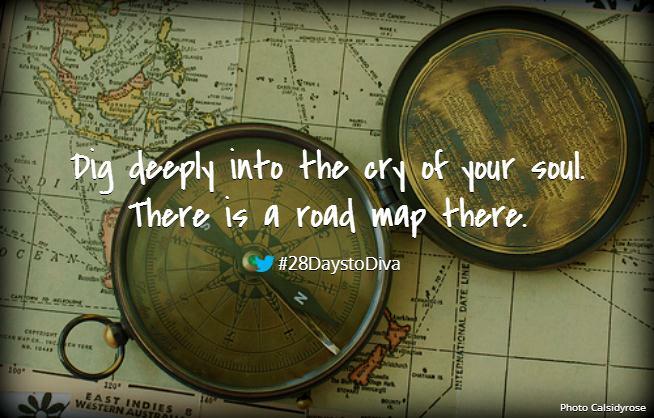 If you didn’t already feel that way, you probably would not have found the 28 Days to Diva series. I am so glad you are here. While you are taking the time to dream about your future, promise me that you will stop for just a moment to also realize how far you have come. Ars longa, vita brevis. But, we’ll do our best. I hope you will stop back tomorrow. We have so much to talk about. Until then, you can find me tweeting about my favorite things at @mezzoihnen. Won’t you join me?